Tandragee, County Armagh, 21 October 2013 – Lafarge Tarmac’s Construction Solutions Contracting Business, recently purchased a Rapidmix 400CW mobile continuous mixing plant, for use on nationwide pavement construction applications. The Rapidmix was used initially to produce circa 39,000 tonnes of CBGM (Cement Bound Granular Material) between April and July 2013, working as a subcontractor to Lafarge Tarmac Contracting South Wales for Sisk Roadbridge on the A477 St Clears to Red Roses Improvement. The contract is a Welsh Government funded 9.3 km long new build road project to improve the road network from St Clears roundabout to Pont Newydd. 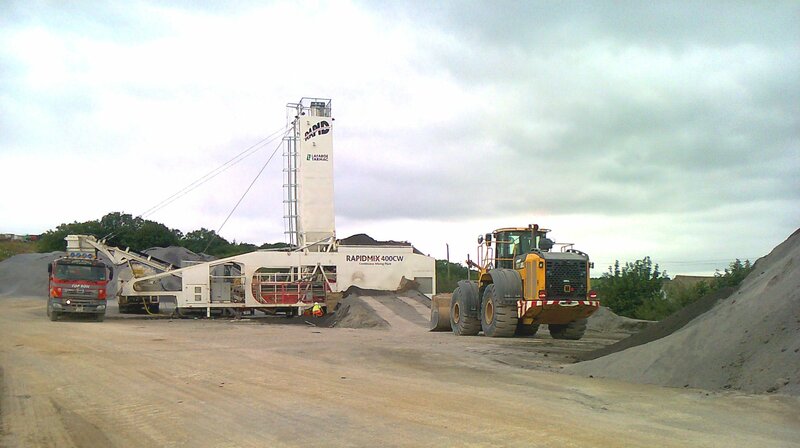 Northern Ireland based Rapid International’s Rapidmix 400 and 600CW continuous mixing plant, can be successfully used to produce high quality hydraulic bound materials using hydraulic binders from Cement to Fly Ash and Slag. 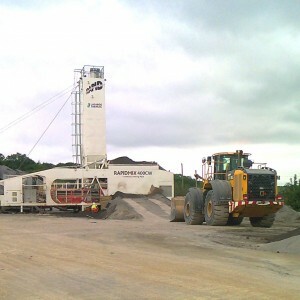 Kevin Marshall – Contract Production Manager in Construction Solutions, commented, “The use of hydraulic bound materials in new build road construction is increasing, and the Rapidmix Plant is a very useful addition to increase Lafarge Tarmac’s capability and flexibility to produce high quality site mixed materials. The support from Rapid International has been excellent including set up and operator training. Recently updated to incorporate full weighing options for all materials – aggregates, cement and water, the new generation Rapidmix 400 and 600CW offers record keeping that is fully automated, precise and detailed. Fully mobile and self contained, the Rapidmix offers a complete plant powered by its own power source, with on-board compressor and generator. Fitted with a self erecting system, using hydraulics, the plant can change from travel mode to fully operational within a few hours. The Rapidmix 400/600 CW mixes up to 400 or 600 Tonnes per hour depending on application and provides feed rates that are fully adjustable for the aggregate, cement and water systems.